Bintulu Resident, Jack Aman Luat (seated second left) posing with Samalaju State Assemblyman, Majang Renggi (seated centre) and other members of the organizing committee after the press conference on Similajau Nature Challenge in Bintulu on Tuesday. BINTULU: Sarawak International Similajau Nature Challenge, which was last held in 2015, will be revived. Now renamed as the Similajau Nature Challenge (SNC) 2018 or Pesta Similajau, it will be returning on November 3 at Similajau National Park (SNP) Bintulu, situated about 30kms from Bintulu town. Bintulu Resident, Jack Aman Luat, who is the co-organiser with Bintulu Divisional Tourism Task Group, said the event was able to attract about 300 local and international participants when it was last held. “This run is a bit challenging. However, I would like to encourage the public to take part in it,” he told a press conference at the Bintulu Resident’s Office here on Tuesday. 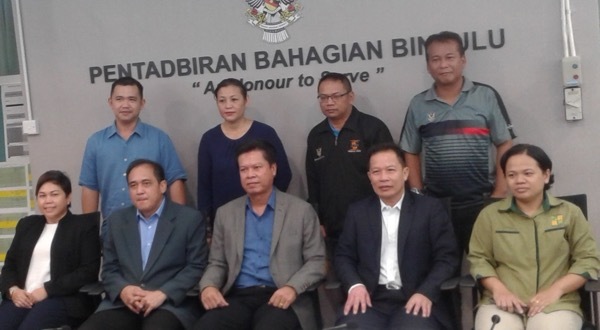 Jack added the organizing committee had been formed with the cooperation of Tourism, Arts, Culture, Youth and Sports Bintulu Division, Sarawak Forestry Corporation (SNP), Bintulu District Office and the various agencies and NGOs in Bintulu. Among the main events is the 19.5 km Beach & Trail Run for Group Participation (2 men or 1 man and 1 woman; age limit – 21 years and above). The registration fee is RM50.00 per team. Cash prizes totalling RM12,000 are up for grabs. The winning duo in the Team Category will bring home RM4,000 while the first, second and third runners-up will get RM3,000, RM2,000 and RM1,000 respectively. Those placed in the fifth to eighth positions will each receive RM800, RM600, RM400 and RM200 respectively. For the 7.5km Men Single (Senior) and Women Single (Senior) Run, the age limit is 31 years and above. For the 7.5km Men Single (Junior) and Women Single (Junior) Run, the age limit is 30 years and below. The registration fee is RM20.00 each for both categories. Meanwhile, cash prizes of RM11,440 are up for grabs in the four categories, namely, the Men Single and Women Single (Senior) Category and Men Single and Women Single (Junior). The respective top winners will win RM700 each while the first, second and third runners-up will pocket RM600, RM500 and RM400. Those finishing in the fifth to eighth places will each receive RM300, RM200, RM100 and RM60 respectively. All those who finish the race within the allotted time according to their categories will be given medals and certificates of participation. According to the organizing chairman of SNC 2018, this year’s event will exclude the cycling event. The closing date for registration is October 26. The two-day event will kick off on Friday, November 2 with side activities like tug of war, wall climbing, mass aerobics, food stalls and exhibition booths. For further enquiries, call Jacqualine Richard Lee / Kederi Yusof of the Ministry of Tourism, Arts, Culture, Youth and Sports Bintulu (SNC secretariat) for more information at 086-254072. Similajau Nature Challenge returns 0 out of 5 based on 0 ratings. 0 user reviews.